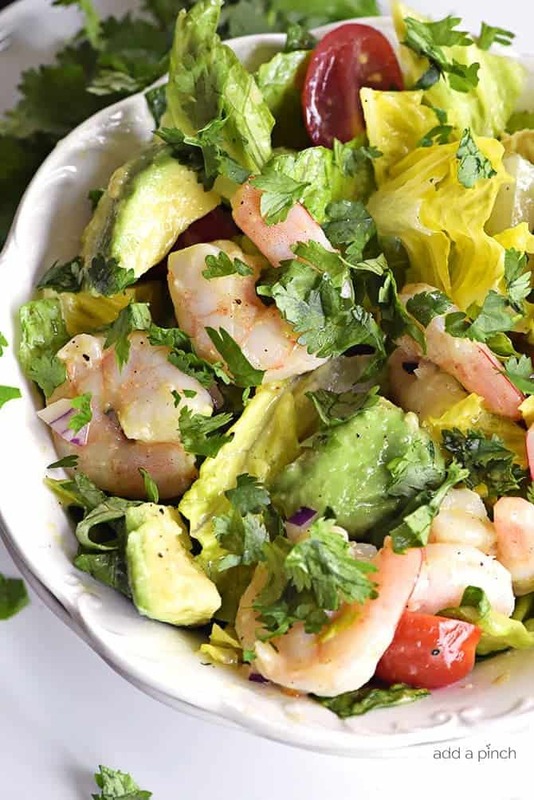 This Cilantro Lime Shrimp Avocado Salad recipe has all the flavors of summer in every delicious bite! So quick and easy to toss together and perfect for a lunch or a light supper! This past weekend, we were in sunny Florida and all that gorgeous weather had me craving summery dishes like this salad. When I got home, I couldn’t wait to make it! 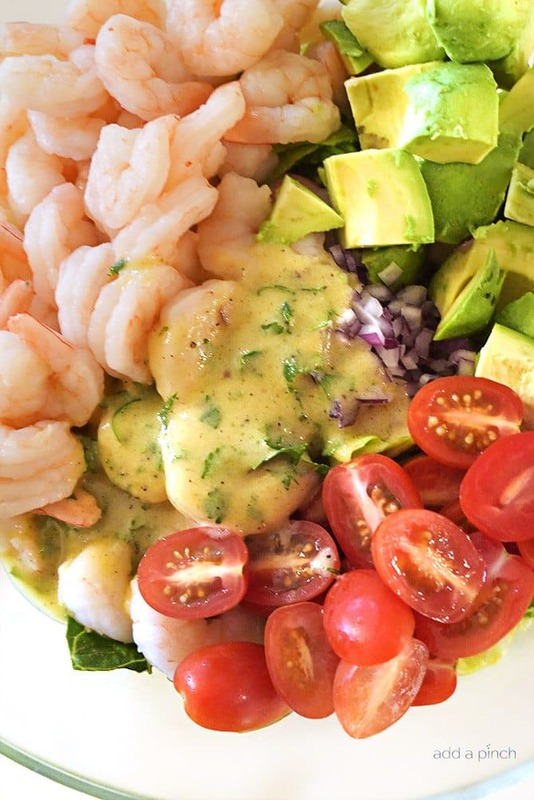 If you have made and enjoy my other shrimp avocado salad, I think you will love this one, too! Talk about the perfect quick-fix lunch! To make it, I started with a head of fresh romaine that I chopped and then topped with fresh shrimp, avocado, diced red onions, grape tomatoes, and an amazingly easy and tasty cilantro lime vinaigrette dressing. I then lightly tossed it all together to make sure everything was evenly coated with the dressing and added just a bit more chopped fresh cilantro to the salad for serving. While it isn’t necessary, it sure does make the salad even prettier, I think. 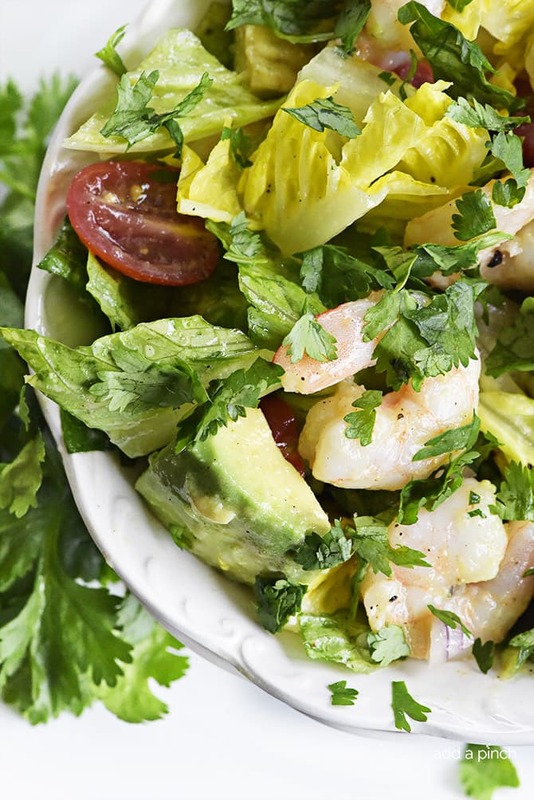 Here’s my Cilantro Lime Shrimp Avocado Salad recipe. If you are craving summer, I think you’ll love it! 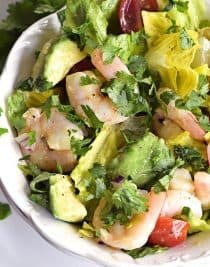 Cilantro Lime Shrimp Avocado Salad Recipe – This Cilantro Lime Shrimp Avocado Salad recipe has all the flavors of summer in every delicious bite! So quick and easy to toss together and perfect for a lunch or a light supper! Add chopped romaine lettuce to a large bowl. Top with shrimp, avocado, tomatoes and red onion. Whisk together olive oil, lime juice, garlic, cilantro, Dijon mustard and salt and pepper. Pour the dressing over the salad and toss to evenly distribute the dressing and serve.